Mount Saint Elias Photo, Wrangell St. Elias National Park and Preserve, Alaska. Mount Saint Elias, 18 008' high, catches the last of the sun's rays for the day, Wrangell - St. Elias National Park and Preserve, Alaska - aerial photo. The rocky islands, or outcroppings, in the foreground are called Nunataks. Please click on the image above to view a larger version of this photo. Mount Saint Elias is possibly one of the great unsung heroes of American mountains, possibly all the world. Towering 18 008′ tall, the mountain rises right from sea level to its lofty summit. 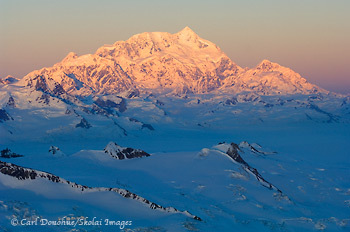 The Saint Elias coastal range are the world’s tallest coastal mountains, and Mount Saint Elias is their crown jewel. It’s also the crown jewel of Wrangell – St. Elias National Park and Preserve, the nation’s largest national park, and finest preserve of wildness and wilderness. From the north, Mount Saint Elias is bordered by the Bagley Icefield, largest non polar icefield in North America at nearly 130 miles long. There is simply no end to the superlatives for this massif. This photo is from the end of an amazing flight-seeing trip to the Saint Elias range. Absolutely jaw-dropping stuff. We didn’t arrive back to the landing strip until dark; super was late this night. But the chance to be in the presence of such magnificence is a treat to be savored as long as possible. I was pretty glad to have had the opportunity. Mount Saint Elias is the 2nd tallest mountain in the nation, the 2nd tallest mountain in Canada (it sits right on the border). I’d be surprised if more than the smallest fraction of visitors to the region ever even see the mountain, however, simply because so few people make the trip. It’s not a roadside venture at all. But oh wow, oh so worth it. More photos of Mount Saint Elias and the Saint Elias coastal Range region of Wrangell – St. Elias National Park and Preserve. This entry was posted in Aerial Photos, Alaska, Landscapes, Wrangell - St. Elias National Park and tagged Landscapes, Mount St. Elias, scenics, Wrangell - St. Elias National Park on March 30, 2011 by Carl D.